A few days ago I wrote about the importance of taking national or regional real estate articles with a grain of salt. And then yesterday, the East Bay Times published a front page story that clearly illustrates just what I mean. 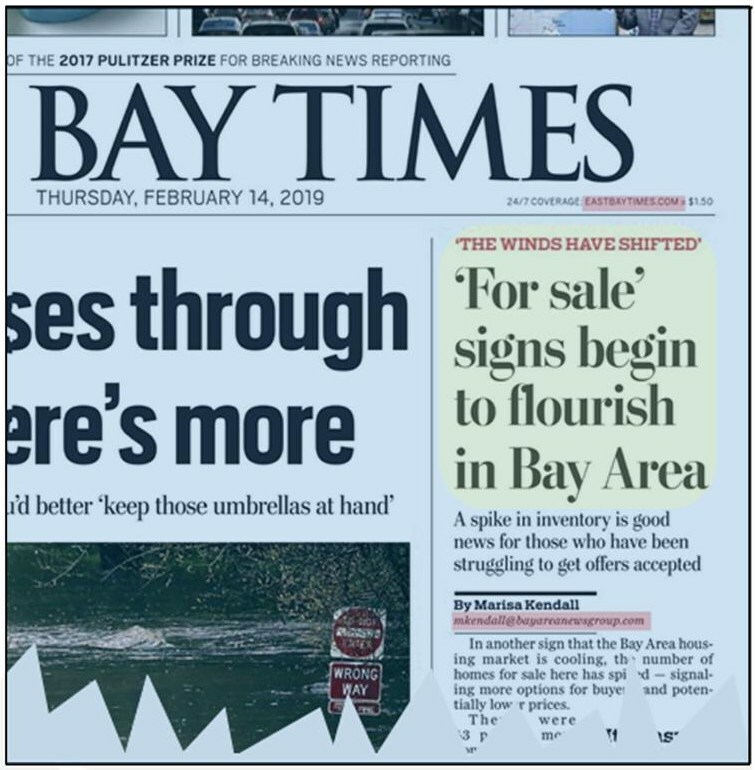 For right below the paper’s masthead were two headlines — one proclaiming the Winds Have Shifted and another saying that For Sale Signs were springing up everywhere. The gist of the article was that housing inventory was on the rise throughout the Bay Area. Yet, if you read my Feb. ’19 Local Solano Housing Market Update a few days ago, you know that that’s hardly the case locally, with housing inventory falling in 3 of Solano County’s 4 largest cities over the past 30 days. This is a classic example of why it’s important to take those national and regional housing trend articles with a big grain of salt. As I pointed out in my recent post, residential real estate markets are hyper-local and what happens in one area can often be quite different than what’s happening elsewhere. Yet most of the stories you see in the national or regional news media are based on statistics covering a wide area. What’s more, despite what the Zillow economist might think, from a statistical standpoint there really is no such thing as a “Bay Area Housing Market.” There are many micro-markets within the Bay Area and each is unique and independent of the others. It would be appropriate to lump Fairfield, Vacaville and Suisun into one market. And it would make sense to combine Pleasant Hill and Martinez for statistical purposes. But you’d never combine Benicia with Pittsburg and Antioch. Nor would you lump Vallejo, Walnut Creek and Danville in the same statistical bucket. So a blanket statement proclaiming an emerging trend for “Bay Area Real Estate” makes no sense. The only ones who really know what’s happening in these real estate micro-markets are those who are in the market day-in and day-out. An economist sitting at a computer in another state can’t really know the subtle differences between the various real estate markets within the Bay Area. But when the news media gets a news release from a respected economist, government agency or housing industry think tank, it usually jumps all over it and endorses its findings as proof of an emerging trend or change in the market. A press release that arrives in early February quoting 4th quarter statistics sounds recent…until you stop and realize that a home that went into contract in August and closed escrow in early October becomes part of those 4th quarter statistics. And what happened in August, September and October isn’t going to tell you what will happen the following February, March or April. So again…when you read one of those national or regional stories proclaiming some recent statistic as proof of an emerging trend, take it with a grain of salt. Rely instead on news that’s written by those who are intimately familiar with your local market to tell you what’s really happening. I’ll be posting local real estate market updates and observations on an ongoing basis. So if you really want to keep your finger on the pulse of what’s happening in the Solano-Central Costa housing market, check back often.